The Gentleman of the house. 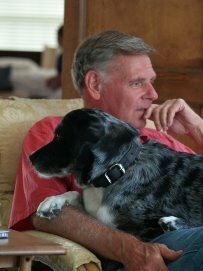 Father, grandfather, educator, dog lover, vintage auto and gun collector, Joe has followed a wide range of interests and passions. His current passions are his family and Spring Lake Woods. Read how our guests reviewed their stay with us! Shirley Thomas... The Lady of the house. Wife, mother, grandmother, retired banker, cook, and general all around overseer of most things pertaining to our guests.The Thomas' entrance into the bed & breakfast business was Shirley's brainchild over 10 years ago.Known by many around here as the hardest-working woman in Hopkins County, Shirley devotes most of her time, when not with grandaughters Emma and Hayley, that is, to care for and improve the business, all the while making it look easy.